One man's drive for cleaner energy has run up against historic preservation guidelines in a Louisville neighborhood. Panels should not be visible from the street, city says. Homeowner contends they need to be on south facing roof for optimal performance. Dispute comes as largely coal-fired city embraces a push to make clean solar power mainstream. 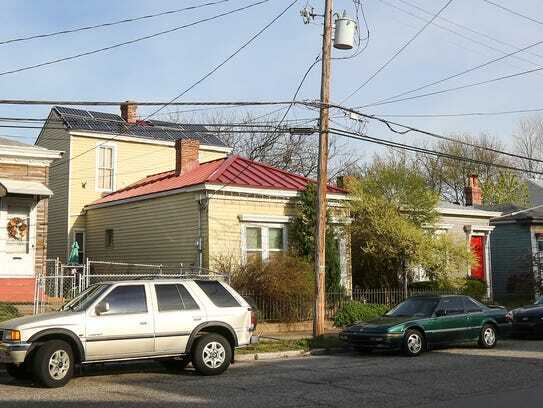 A Louisville resident's rooftop solar installation has collided with one neighborhood's historic preservation requirements, setting what city officials described as a first-of-its-kind architectural design battle. The dispute comes as a largely coal-fired city begins to weigh just how much it will embrace making clean solar power mainstream. In a sign of solar's growing pains, however, city planners have told Clifton resident Mark Frazar that the solar panels he installed in December 2014 on his William Street home violate historic preservation rules because they are visible from the street. He was fined $100, and, after an appeal, his case has been set for a hearing by an architectural review board April 13 to determine whether they need to be removed. "They are hanging their hat on visible from the street," saying that's not allowed, said Frazar, a project manager for an architectural firm, in an interview. "That's certainly making it pretty difficult." Frazar has spelled out his case in correspondence obtained by The Courier-Journal through the Kentucky Open Records law. "I ask you to take into account our need for lower energy consumption and renewable energy sources," and conditions specific to his home, he wrote to city planners. Solar panels need southern exposure, he said. At his home, he limited panels to a south-facing roof atop a rear, second-story camelback portion of his shotgun-style 19th-century home. 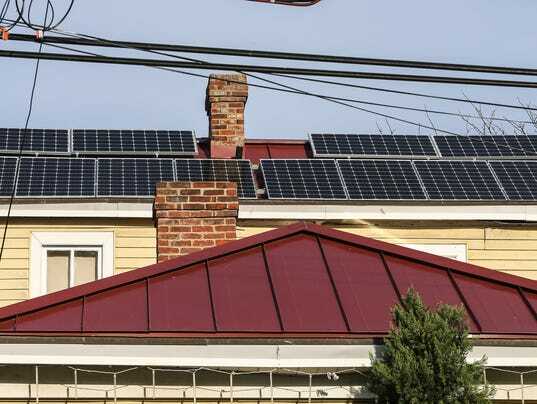 For their part, city officials insist their policies in neighborhoods with historic preservation rules do not hinder residents from adding solar panels. Frazar should have sought what the city calls a certificate of appropriateness, said Develop Louisville spokesman Will Ford, who said this was the first time solar panels have gone before an architectural review committee after those solar panels had already been installed. "If the homeowner would have consulted with the urban design team before installing the solar panels, they could have worked as a team to find a solution for the location of the solar panels on the property," Ford said. "Solar panels are treated like other proposed exterior changes in a historic district. "Solar panels are not discouraged in historic districts, but they must fit within the guidelines of the historic district." Frazer said he was not aware of any limits on solar panels when he reviewed the guidelines in 2014. Seven Louisville neighborhoods have been designated historic districts, requiring government oversight of exterior alterations, demolition and new construction and installation of solar panels: Butchertown, Clifton, Cherokee Triangle, Limerick, Old Louisville, Parkland and West Main Street. His challenge comes at a time when Mayor Greg Fischer has blessed a Solar Over Louisville effort that seeks to persuade Louisvillians to install 2 megawatts of solar capacity this year. That's roughly enough capacity for 333 typical homes, said Nancy Givens with Solar Over Louisville. The Louisville Metro Council also last year passed a strongly worded resolution in support of solar power, encouraging the discussion and promotion of solar use on public and private buildings. Frazar included that resolution in his appeal. In August, The Courier-Journal reported that solar installers acknowledged that workarounds in historic districts are possible in some situations, but sometimes the limitations mean not enough panels can be put on a roof to cover a home's electricity needs, or the panels cannot be installed for optimum efficiency. Frazar has support from the David Coyte, land-use and preservation chair of the Clifton Community Council. "I am more than sympathetic," said Coyte. "My position is that if we don't allow such things (as solar panels) there won't be a future to value the history we are seeking to protect," citing concerns about global warming and a need for cleaner energy. "We should welcome and support anyone in Clifton who is seeking to develop alternative energy resources," he said. Records show that Frazar did consult with city officials after he was cited last year but with less than satisfactory results. Frazer in January told officials that moving the panels to the rear roof would have cost $3,000 and would have made the panels 30 percent less productive. "Initially, I expected a return on investment at 11 years (but) those two factors might push it closer to 25," he wrote. "For those reasons, I really feel I have no choice to appeal to the board to maintain the current location." He said he avoided the part of his roof that was closer to William Street, keeping the panels 50 feet from the curb. They are mounted "low and tight" to a new metal roof that was designed to reflect roofing common to the 1890s, he wrote. Further, "one can't help note that the routine installation of satellite dishes, antenna and both ground and window mounted air conditions ... that are "generally more obtrusive to the historic profiles of homes and businesses than are solar modules." Frazar asked city officials to recognize that when homes on his street were built, there were no utility poles, transformers, telephone wires or electric and gas meters - and there were outhouses out back. "It seems to me that that with changing energy needs there must be some greater allowance for even these small but historic structures to adapt to the times." As I was reading this I kept thinking about how hideous those power lines, poles, and transformers look. And the solar panels are the problem?? ?